One controversial topic is whether utilities should have to pay for damage their equipment causes — even if the companies followed state safety regulations and laws. As 17 fires burn across the state, California's legislature is grappling with what it should do to help residents cope with blazes. The most controversial question facing the state is a decision over who should pay when power lines touch off destructive blazes. That has set off a huge political fight in the state capitol. On Thursday lawmakers heard hours of testimony on a proposal by Gov. Jerry Brown to tweak state liability laws. Currently, utilities can be on the hook financially for fires even if they are not negligent in maintenance. Brown isn't proposing a complete repeal of the liability laws, but he wants to throw the question to the courts. Brown's proposal would allow judges the discretion to assign responsibility for the fire, weighing whether the utility company followed all safety regulations, how much the property was harmed and whether safer electrical systems were available but not used. Huge liability costs for utilities are a very real scenario. State fire investigators have found Pacific Gas & Electric, the state's largest utility, responsible for 16 of last year's devastating Northern California wildfires. Those fires killed dozens of people and destroyed thousands of homes and PG&E is currently facing estimated liability costs of at least $2.5 billion. On Thursday, a representative of the governor told lawmakers that the change would bring the electric industry in California more in line with flood control districts, which aren't forced to pay for property damage if they followed state safety laws and regulations. State Sen. Hannah Beth Jackson, whose central coast district was devastated by last year's Thomas Fire, wasn't buying it. "I'm troubled by the fact that you're trying to compare the two as apples to apples when they're really not," she said. Some of her constituents are suing another utility, Southern California Edison, for damages caused by the Thomas fire, which, until this week, was the biggest fire in state history. Cattle rancher Richard Atmore of Ventura is one of those suing Edison. He says utilities should have done more. "They never wanted to participate in the vegetation management practices they did 40, 50 years ago, but all of a sudden they got more interested in profits than they were in prevention work," he said. The utilities, however, argue that as climate change makes wildfires more frequent and severe, they won't be able to survive financially if they're held liable for damages. They are warning that if they run into financial problems, the state's ambitious climate change goals — an issue near and dear to Governor Brown — will be at risk. 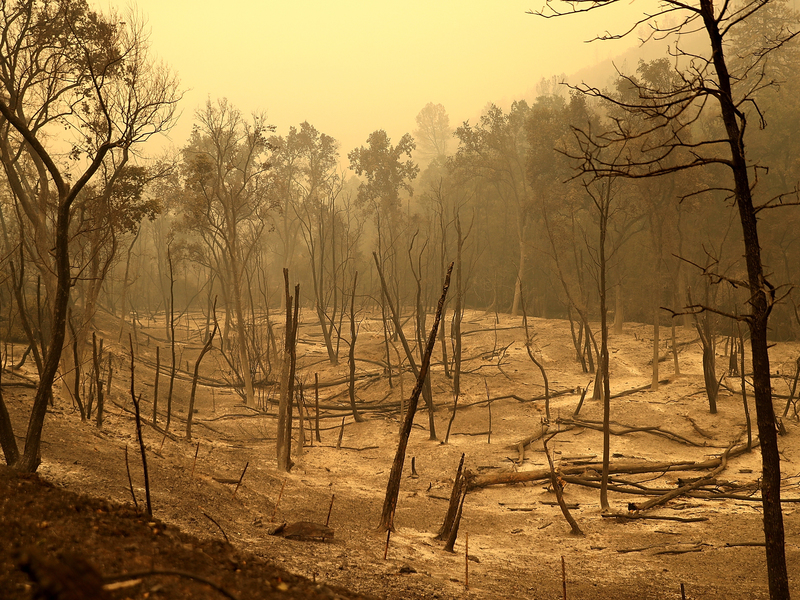 "California's existing liabilities laws weren't made for the new normal that we face going forward with these climate driven wildfires," said Steve Malnight, a senior vice president at PG&E. "It's creating really significant financial risk to the utilities which will limit our ability to continue making the investments we need going forward." And may even threaten bankruptcy. PG&E is taking this political fight seriously. The utility has spent the same amount on lobbying — $1.6 million — between April and June this year that it spent in all of 2017. That's on top of nearly $1 million in political donations to key players this year. Governor Jerry Brown said recently that he's trying to find a middle ground. "My goal was to try to find a reasonable balance that will reward players, including utilities, for doing the right thing. But make them liable when they didn't take the steps that common sense and prudence would warrant," he said. PG&E's Malnight said Brown's legislation is a good start, but doesn't go far enough in protecting the electric utility industry. Meanwhile, Ventura cattle rancher Atmore sees the proposal as a giveaway to a powerful, connected corporation. "I think the governor's proposal is too far slanted towards protecting this huge corporation of the utility companies," he said. "They give a tremendous amount of money but just because they give a lot of money lobbying does not mean that you looked the other way when they cause a big mistake." It's now up to lawmakers to decide how to strike a balance. They only have three more weeks, until the end of the legislative session, to do it.